Is it too late to socialize our 2 1/2 year German Shepherd? As much as I hate to admit it, my husband and I are guilty of not socializing Morgan. We did take him to puppy kindergarten and when the class sat on the floor in a circle, to pass the puppies along to visit with others, Morgan participated for a very short while then went out of the circle and just laid down behind me. The instructor advised us to let one of the other classmates take him next week so he would get use to not being with me so much. We did that, but again not interested and he just wanted me or my husband. That said, he is now two and a half, and he is not receptive to anyone (neighbors, etc.) He will go after them barking, he does not bite, but will push with his nose. I know we have created a mess. Is it too late for me to work with him to get him socialized now. We could use any advise you have for us. Truly, we are at a loss on how to approach this, but we know he needs some training in this manner. He very intelligent, and learns very quick. He has an incredible vocabulary and we find ourselves spelling things now. Any information you can provide, I would appreciate. so you need to make the decision to really do it even though it won't be easy. Plus it will be better for your GSD too - and your neighbors, your family, and you, etc., etc. You need to have control over your dog. And right now you don't. German Shepherds are very intelligent - you know that for a fact. And if you don't exercise that big brain of theirs - in addition to their bodies - you are just asking for trouble. German Shepherds need a job! So if I were you I would sign him up for another obedience course that you and your husband can both attend - very important, because you need to be trained on how to train the dog too. Or if you have the ability, you can hire a personal trainer that will come to your home and work with you all, one on one, so to speak. Plus, start training your dog at home - teach him new tricks and new games. This is a great way to get those brains all nice and working. New things you have never tried before or maybe even training you once did but haven't done in a while. Revisit that and start training all over. In the end, if you train your German Shepherd, you will all be happy - but most importantly, your German Shepherd will be happy and it will make the whole family dynamic so much easier. 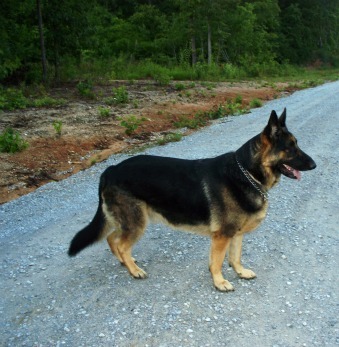 So good luck and have fun re-training your German Shepherd Dog.